It’s well and truly autumn and while the goose is getting fat for Christmas, it also seems I’m doing my very best to build up a solid layer of insulation against the winter chill. There’s nothing better than tucking into a hearty feast on a cold day and now that I’m all grown up and living in zone 4 (eeks), chez littlemissvino has become quite the place for dinner parties. A couple of weeks ago, two of our very good friends came round so we decided to make Jamie’s chicken pie with carrot smash and minted peas – watch how to make the recipe here. The pie went down a storm and was followed by homemade chocolate brownies (they were scoffed too quickly for me to take a pic). 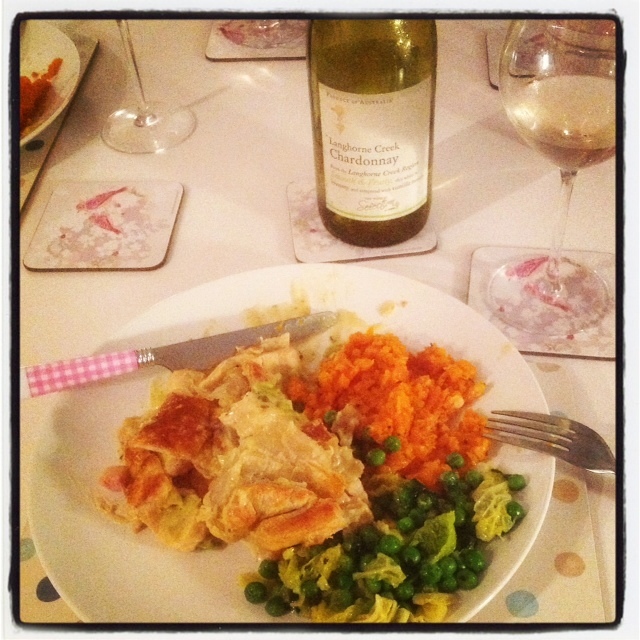 To accompany the pie, I chose a Langhorne Creek Chardonnay from Asda’s new Wine Selection range – a spot-on match for the creaminess of the chicken pie filling. I’ve often found people tend to shy away from oaked Chardonnays, but a subtle touch of oak can bring vanilla and creamy hints to a wine which make this style of Chardonnay the ultimate pairing for dishes such as spaghetti carbonara, butternut squash risotto and of course Jamie’s chicken pie with creme fraiche and English mustard. It’s currently only £5 too so I’d highly recommend it.